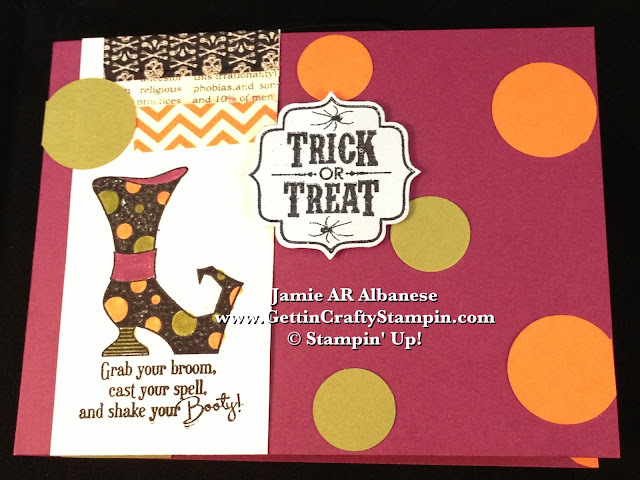 Getting Crafty with Jamie: Trick or Treat, Shake Your Booty! Trick or Treat, Shake Your Booty! Can you feel it? The Thumping in the Night... Fall Season is HERE and it's Knocking On YOUR Door!! Whoop Whoop!! Come and Celebrate the Start of Fall and Prepare for this upcoming Halloween Season!! I had to Whip Out my Boot Collection (it's really an addiction, I'm glad to say) and this card was inspired by this love of Fall and Boots!! I don't usually do much for Halloween - my kiddos and I Trick or Treat some friends and neighbors.. but we do a HUGE Harvest Festival at our church. Loaded with Games, Music, Costumes, Laughter and CANDY... it's a Sweet Day to Have some FUN! 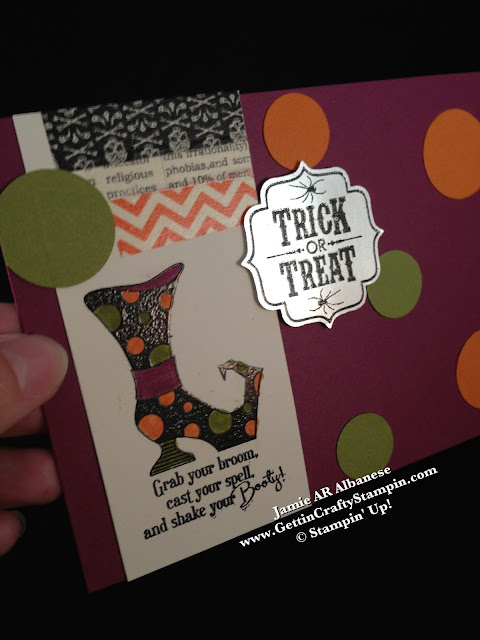 and the Brights Color Collection Stampin' Write Marker Collection (#131259) create this bubbling-over-with-fun card! Carry the dots inside for a fun look. REMEMBER to have the dots 'falling off' the page for a more natural look! Stamped with Versa Mark ink (#102283) after you Prepped the Whisper White card stock (#100730) with the Embossing Buddy (#103083) this boot is prepped for some shine as is this greeting! Heat Embossed Black Powder (#109133) and our Heat Tool (#129053) for a stunning look! 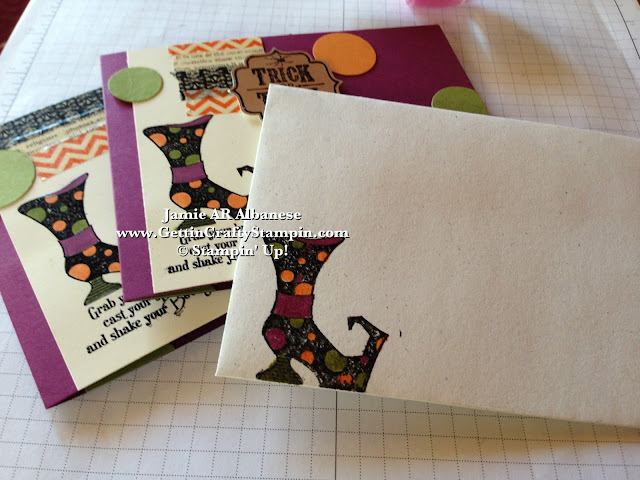 Using the Tags 4 You BUNDLE (#133294) for a 15% Savings on the stamp set and coordinating punch! Heat Embossing the Black on the new Silver Foil sheets (#132178 pg. 28 Holiday Catalog) for a cool POP of Metal and Shine! The Witches Brew Designer Washi Tape (#132156 pg. 20 Holiday Catalog) for a cool mixed pattern look! Do you feel the thumpin' yet?? Go ahead - shake your booty, baby!! Coordinate your envelopes (#107301 Whisper White 40 Envelopes for only $6.50!) for a well-styled look! Mixing Patterns, Polka Dots, Metallic, Patent leather look and Boots - baby - one can't HELP but be in LOVE!! What do YOU Think?? Leave me a comment and let me know! Pin, Email, Facebook, Tweet this and Join Me with a Follow on those avenues in life and more!! Love our Cutting Edge Style?? CLICK HERE to see our top quality Tools, Stamps, Papers and more!! Shop 24/7 and earn BONUS Frequent Buyer Points! This Holiday Season is PACKED with FUN! (CLICK HERE to Join My Classes and Clubs!) Let the fun in - when it comes a thumpin'! Style FLY in Bold Colors, Patterns while adding Metallic Accents! 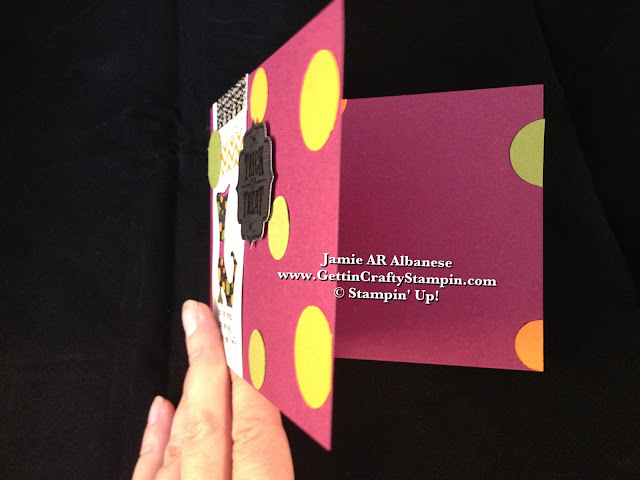 From Card Making to Fashion - your SURE to be the cutting edge!! Happy Fall-Y'all! !